Traditions Restaurant and Catering in Tyler, Texas presents upscale cafeteria-style dining at family prices. Our menu features a wide variety of items made from scratch and prepared on-site. We proudly serve fresh produce, locally grown whenever available, along with fresh fish, grilled chicken and other healthy alternatives. You'll also find those delicious casseroles and comfort foods that are a part of our family traditions. 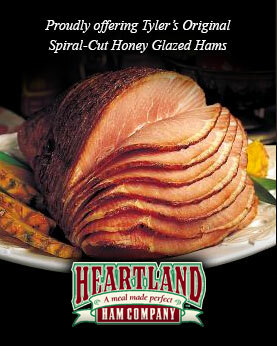 We are proud to offer Tyler’s Original Spiral-Cut Honey Glazed Heartland Hams to bring your family the best home cooked meals for quality and convenience. And just in time for the holidays, everyone's favorite from Heartland Ham, the Pumpkin Roll. Join us for lunch and dinner in our formal dining room. Visit our Bistro for a more casual dining experience, or try our quick drive-thru window for a healthy meal to go. You can call ahead and use our convenient "Bistro & Take Out Menu" for ordering. Let Catering by Traditions do all the work for your next event! Whether it's a formal wedding reception, corporate event, holiday gathering, or business meeting, Traditions offers an extensive menu with a variety of options for events of all sizes.